One of the first things I ever cooked that made me feel like I could cook (well, besides dishes containing canned veggies and creamed soups, that is!) was homemade croutons. When we were first married and I was still finding my culinary voice (i.e. cooking not-so-great food on a not-so-great budget in a really-quite-awful basement apartment kitchen), chicken caesar salad with homemade croutons was one of our go-to “gourmet” meals. Okay, not so gourmet, but it felt gourmet and gave my cooking confidence level a much needed boost! 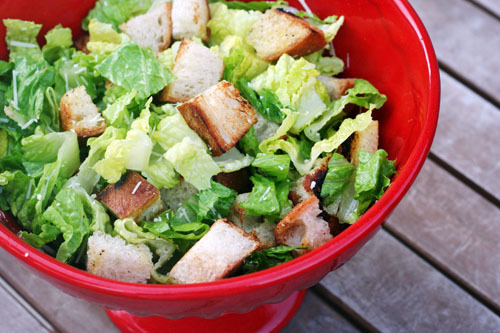 Last night I made homemade croutons for a simple caesar side salad. It’s been a while since I’ve made croutons and cooking them transported me back in time to that tiny basement kitchen. It also reminded me how delicious homemade croutons are, all crispy and flavorful on the outside, soft and yummy on the inside. There’s nothing better. And it’s a great way to use up stale, leftover bread. Without further ado, here is how I make croutons. Feel free to share your own crouton-cooking tips if you have them! Heat up a large skillet over medium to medium-high heat. Pour in a couple tablespoons of olive oil and let it heat up (you can use butter or canola oil if you don’t have olive oil on hand). Evenly salt and pepper the pan and oil, then evenly spread your bread pieces in the pan and toss with a spatula (I just dump the bread in and quickly toss it all around to evenly distribute the oil and seasoning – you may need to drizzle a little more olive oil over the top of the croutons if it doesn’t seem like you have quite enough). Sprinkle with herbs of your choice (oregano, basil, rosemary, whatever”¦last night we didn’t use any herbs and they were still fabulous). After tossing them a bit, let the croutons sit over the heat for about a minute at a time, tossing in between. Cook until they start to get browned and crispy on the outside, but not burned. I usually make croutons on the stovetop, as opposed to the oven. It feels easier to me, although it’s probably about the same (minimal) effort. If you want to cook them in the oven, just toss the bread pieces in a large bowl with the oil and seasoning, spread into 1 layer on a cookie sheet and bake at around 400 degrees until they look done, flipping once or twice during cooking. I didn’t know you could do these on the stovetop! I just hate heating up the house with the oven if I don’t have to. Thanks for the tip! One of my best friends in college, who really wasn’t a very good cook, made the best homemade croutons! And to this day, I’ve still never made them. Thanks for the inspiration! meg – yes, I love doing it on the stovetop versus the oven, especially in the summer! glad I could help! I don’t, won’t and can’t cook, But I thought I’d have a bash at these.Used butter,olive oil, garlic and sea salt. Wonderful. So thrilled I made a second batch but in the oven this time. Result was awful, drab tastless On analysing it, my butter etc must have vanished (not enough I suppose) very quickly leaving the croutons dry and lonely and ‘cos I didn’t keep checking them burnt as well! I’ll know better next time and cook them on top Thankyou for motivating me and at 73 it’s about time. well, I am DELIGHTED that I helped motivate you to cook! yay! and am so happy the first batch was so yummy! and, you know, when I have failures like your second go around, it’s just always so helpful for knowing what not to do and making the recipes better and better – so it’s a good thing, right? 😉 anyway, so fun to wake up to your comment – thank you! I went to TJ’s to buy peanut flower this morning, and guess what … they don’t carry it anymore because of low sales (according to this article), although I suspect it had something to do with their peanut butter recall. I was so bummed. Why have I never made this before?!?!?!? I just found your recipe. I haven’t even eaten yet but I had to let you know how delicious the one I just tried! I have an herb garden so I was even able to use fresh herbs – tonight’s selection was rosemary, basil, thyme & parsley. I am hoping this will forever eliminate the 6 month old boxes of croutons that we forgot we had. THANKS!! One question – is it possible to make extra & put them aside? Just curious if they’ll keep a day or 2 & if so, how you store them. I am SO glad you loved making them so much! makes my day! I’m sure they would last a few days in an airtight container or a ziploc bag. and if, for some reason, they get a little less crispy, I would just throw them in a 300 degree oven for a few minutes and they should be back to normal! but I doubt you’ll even need to do that! Thanks Jane – I only used 1 roll & it was perfect for me & my husband. Small portions are key in our house since it’s just the 2 of us and I really hate throwing out food. Glad I could put a smile on your face!! Jane, thanks for sharing your sweet story. 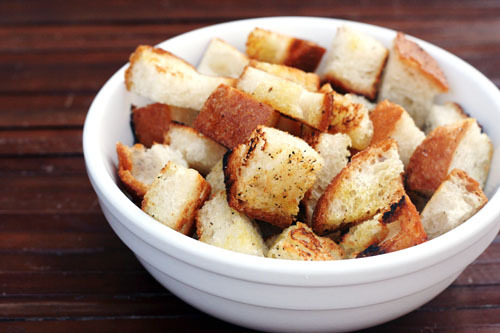 Today, for the first time, I am making homemade croutons with a stale loaf of roasted garlic artisan bread. I have tons of lettuce so I will be eating croutons in salad every day this week. My mouth is already watering! I will be checking out your blog from now on! Thanks so much for this simple and delicious recipe. I have recently found yearning to teach myself to cook, starting with artisan breads! who knew! Now I have more bread than I can eat (thank you sourdough starter!) and find myself throwing away stale loaves. Or I did until now! Thank you for helping find a delicious new way to continue to enjoy the fruit of my labors. Great for us college students on a budget too! Hello, my husband surprised me with a bagged salad today and inside were the hardest croutons ever. . .so I found your site and i’m pretty excited about crispy, home made croutons 🙂 Thanks for the recipe! Hi! I just found your site when I was looking for an easy-to-do crouton recipe. I liked the fact that you didn’t have exact measurements and they didn’t have to be toasted in the oven. So I just finished making them with a bit of stale bread and I decided I need to get a loaf of French bread and make a big batch a.s.a.p.! so glad you found the site and this recipe and that it worked for you – yay! I made croutons last week in the oven (which I haven’t done in AGES) and was so wishing I had just done it this way like I usually do. so tasty! anyway, thanks for commenting! I hope that is the website I’m supposed to enter? I haven’t made my own croutons in years and I always made them in the oven. Your way sounds so much better. I’m dieting and found a wonderful 100% wholewheat bread that has only 40 calories a slice. I’m going to try and make your croutons with this bread. Wish me luck. good luck with your bread, judy! let us know how it goes! hello! this recipe is perfect if you’re looking for a soft crouton – they don’t get too crispy at all – just on the outside, still soft on the inside. it’s delicious! this recipe is VERY forgiving, so don’t worry, you can do it! you can use butter and olive oil combined if you want to or alone. I would do a tablespoon or two of butter in the pan, then add olive oil if you feel like you need more oil. The trick is quickly tossing the bread and trying to coat evenly as soon as you add it to the pan with the melted butter/olive oil. for the seasoning – just sprinkle whatever you are using evenly over the bread, then toss. no need to measure, just pinch with your fingers and give a light sprinkle over all the bread (whether it’s the salt or the herbs). also, for keeping them from getting too hard, just make sure you stir them fairly regularly – you want the croutons to sit for about a minute at a time so the outsides get toasty, but you want to stir every minute or so to keep it evenly cooking and so they don’t get too crispy. Have never made my own croutons but have some carawayrye bread from breadmaker. It is quite hard and I am wondering if I do my croutons in pan will the bread soften a bit? What are some good/creative Halloween costumes for a tween?